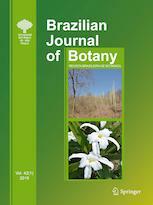 The Brazilian Journal of Botany is an international, broad scope journal devoted to publishing all aspects of plant biology. It publishes original articles across a wide range of disciplines, including (but not limited to) biogeography, cytogenetics, ecology, economic botany, physiology, morphology, and molecular biology. Description of new taxa, floristic inventories and checklists are welcome. For more information please check the instructions for authors.